“Radiolab,” the hugely popular podcast and public radio show about “science, wonder and discovery,” is one of the most curious storytelling specimens on the media landscape. Co-hosted by musician/producer Jad Abumrad and veteran science reporter Robert Krulwich, “Radiolab” digs into knotty scientific and philosophical issues with a dense and highly stylized approach that’s often radically different from the traditional public radio show format. Abumrad, appearing Sunday at the Carolina Theatre in Durham, estimates that the show now reaches about five million people through airwaves and podcast. Speaking from his home in New York City, Abumrad talked with the N&O about creativity, chemistry and chrysanthemums. Watching scary movies at home is a time-honored Halloween tradition, but needing to plan ahead at Blockbuster is a thing of the past. Now, if you’re a Netflix subscriber, hundreds of horror movies are instantly available online. Here are 10 recommendations for streaming Halloween chills, focusing on relatively under-the-radar selections that are worth digging up from the vault—or, if you will, the grave. An old-school haunted-manor-on-the-moors-type ghost story, this moody mystery stars Rebecca Hall as a 1920s scientific investigator whose skepticism is challenged by paranormal happenings at an old boarding school. Nice and creepy. Strange things happen when five people get trapped in a broken elevator, and one of them may be the Devil. A slight but clever indie thriller from producer and writer M. Night Shamalayan. John Malkovich plays silent film director F.W. Murnau, who goes to disturbing lengths to ensure authenticity in his famous vampire film Nosferatu. Willem Dafoe is perfect as Murnau’s decidedly freaky lead actor, Max Schreck. Perfect for a double feature, Netflix also has the original Nosferatu on instant streaming, cut together from several prints in the 2006 restoration edition. The story of the menacing Count Orlock is considered a masterpiece of German Expressionist film, and some say it’s the best vampire movie ever made. My vote for the best vampire movie ever goes to this 2008 horror film out of Sweden. It tells the story of an ancient vampire who appears to be a 12-year-old girl and the subsequent weirdness that transpires. Part art-film horror, part pre-adolescent Gothic romance, it transcends the horror genre to become something genuinely beautiful and disturbing. Johnny Depp plays a rare book collector who stumbles across a cult of wealthy Satanists trying to conjure the Devil. Nothing particularly scary happens, but director Roman Polanski creates a nice atmosphere of chilly dread. Desperate survivors try to outrun feral vampire hordes in this fun indie thriller, which finds new things to do in the well-worn zombie apocalypse genre. Hey, is that Kelly “Top Gun” McGillis as a nun on the run? Yes! Yes, it is! A truly impressive ultra-low-budget indie, Monsters imagines a future in which skyscraper-sized aliens have been walled off in a Mexican quarantine zone. Director Gareth Edwards generated the remarkable visual effects with two PCs and some Adobe software, and went on to make this year’s creature feature Godzilla. 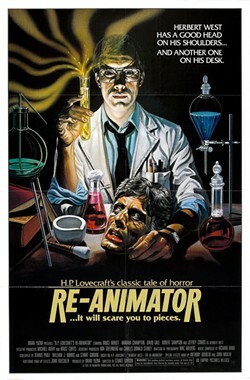 Like Monsters, the immortal cult classic Re-Animator is based in part on the work of horror writer H.P. Lovecraft and his pantheon of cosmic nightmare personages. Campy and exuberant, it’s a riff on the Frankenstein story packed with black humor and excessive, goofy gore. From producer Joss Whedon, Cabin is both a satire and celebration of the slasher genre, with horny young people making poor decisions about basement stairs, knives, forbidden tomes—those sorts of things. The movie’s final act goes full-tilt bananas, making this is a great choice for a rowdier Halloween movie party.